� A full grain leather belt with finished feathered edges and a vintage nickel buckle. 1-1/2" wide. 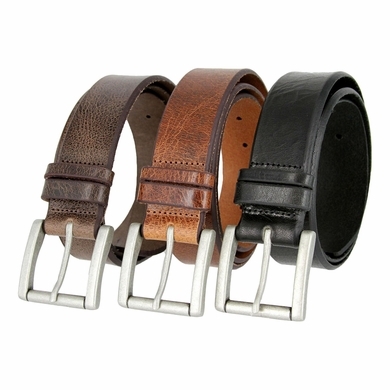 � Strong thick beveled-edge belt to enhance the Natural Vintage Distressing of the leather. � 5 Belt-holes to adjust size and natural finish-so you look through and see it is 100% one-piece leather. � Solid metal antique silver buckle is heavy-stitched on with a unique double loop-one small one big- to hold the excess. � Our Belts are Measured from the fold to the center hole. Measure where you wear the belt in order to get the best size.